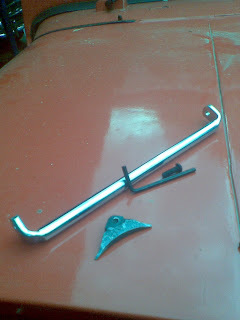 Oh to my badluck with in a weeks time the winch cable protector fitment holder has broken. 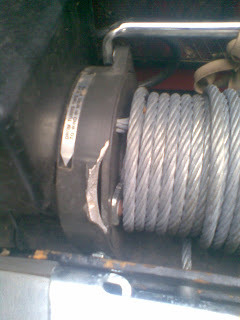 This had happen due to a friend of mine put the hook on the chrome plated rod and tighten the winch in. There was a crack created on the holder and I removed it fully to fix it with the glue. 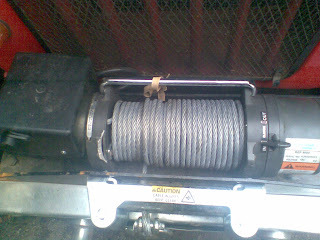 Anyway this piece got nothing to do with the winching operations so I'm bit relaxed. Anyway I has been successfully fixed with anabond and M-Seal combination. Since I have fixed it, no issues. However the lesson learned is that never give away recovery stuffs to untrained people for any reason.